Pixar Symphonies (a DE Mini-Feature Story) + Giveaway! When you watch a movie nowadays, what do you notice? The actors, the actresses, the action, the stunts, the drama…typical things that tend to grab your attention in a movie. But imagine all those things without a little thing called the musical note. You know, the ominous dot with an upward or downward pointing tail seated on a bunch of straight lines. If those things weren’t clumped together on hundreds of pages, the modern movie as you know it would not be so great to watch. What simply was just meant to fill silence in “moving pictures” has become a true art that carries every emotion that a film needs in its many slurs and crescendos. Movie scores, as they’re called, are truly under-appreciated and we must not forget that great music in a great movie is just as necessary as are the great actors. Take for example Disney music. 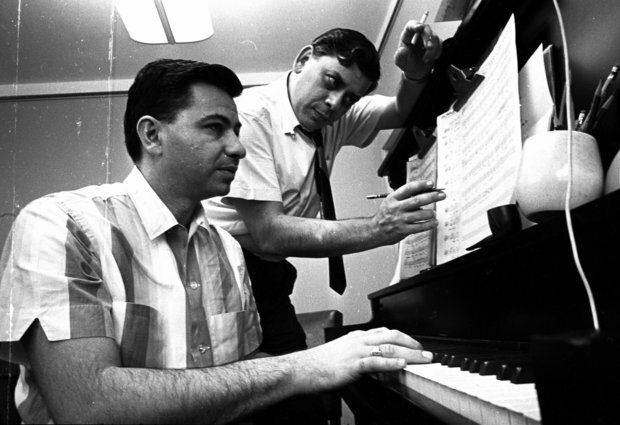 Disney music has its roots in “broadway” with the musical classics like “Aladdin” and “Mary Poppins” written by the famed Sherman brothers seen above, but aside from that, Disney music is also known for their simple melodies that fill the spaces that words cannot. One such example includes the music of Disney’s other company Pixar. Immediately when you think of Pixar, the first thing you might think of most likely was this, this, or even this. It’s music! In time, Disney music grew to include these fantastic musical movie scores again adding to the fact that movie score (more importantly Disney music scores) are timeless and have been and will always be remembered for making us laugh, cry, smile, and even sing/hum along to any time of day or night. And you’re not alone. Pixar’s music, although not filled with lyrics all too much, consist of melodies that carry us through the movie and even afterwards if that little hyperlink experiment above proved anything. Even though Pixar’s movie music hasn’t been around as long as the staple Broadway-style music from the Disney movie classics, it is Disney music that’s worth highlighting and that’s what our friends at Pixar have done for us. For a little over a year now, Pixar music has been traveling to some of the most well-known performance stages in the world being played by some of the best orchestras in the world. Pixar In Concert is literally what it is – it’s Pixar’s movie music played by a live orchestra which plays to a montage of scenes from that particular movie all in front of a live audience. In a world where movie music is always noted in the background, the music here will be center stage giving young and old audiences the pure and deep emotional rush it is to experience a live orchestra play some of the greatest music ever written for human ears. While the concert has been traveling the world for the better part of a year now, it certainly hasn’t been the easiest task to put together a full symphony orchestra concert, folks! We had the opportunity to speak with Jonathan Heeley, Director of Music Publishing at The Walt Disney Company, who also was a part of the team that brought the concert concept to reality. “Each of the orchestras [that get to play this concert set list] has to match the standard Disney is known for,” he said. He continued saying that each of the orchestras that do choose to play this music do have high standards, making it a safe bet that concerts like these with the Disney name on it will express high quality Disney magic. We’ve always wanted to see this concert since it was announced, but we never had the opportunity to until now! 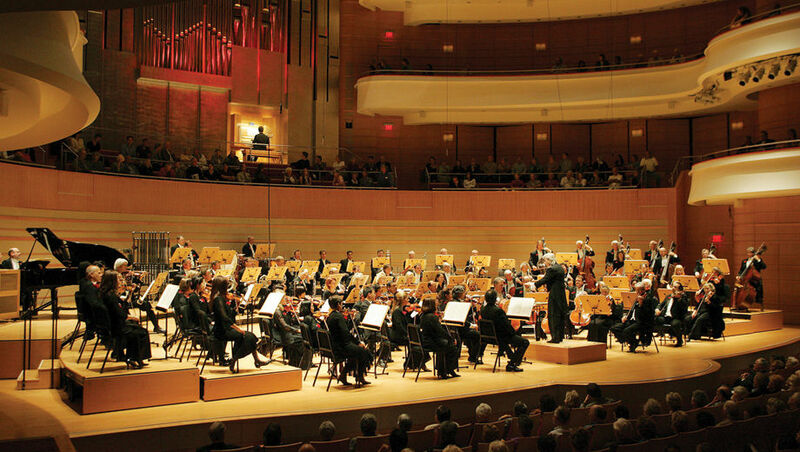 The Pacific Symphony Orchestra based right here out of Southern California will have the opportunity to perform these great pieces of music just a few miles outside of Disneyland in mid August of this year. And we are looking to have that fun (and perhaps cry a lot) when we get to see the concert performed by the Pacific Symphony on August 17 at the Verizon Wireless Amphitheater in Irvine, California. Tickets are still available for the concert, but since this is a ONE NIGHT ONLY event, its best if you don’t delay your purchasing any further! But if you just don’t have the money to go or if tickets aren’t available as of this posting, we’ll take care of you. Just two of you only actually. That’s right! We’re giving away TWO (2) tickets to Pixar In Concert with the Pacific Symphony where you’ll even be able to meet the DisneyExaminer Staff too! What a prize! What do you have to do to enter? It’s quite simple actually. 1) In our comments section below (powered by our friends at Disqus), leave a comment! 2) The comment must consist of your full name, email address, and a reason why you should be the recipients of the pair of tickets* in 100 words or less. *We will be giving away the tickets as a pair to one person only! And that’s it! The last day for entries is Saturday, August 10 and we’ll choose a winner from among those entries on Monday, August 12. We hope all of you enter our giveaway in hopes that you’ll get to fully understand the reason behind this story. In hopes you’ll understand that Disney music is Pixar music and without it, the movies mean nothing. Like silence. UPDATE 8/12 – We’ve extended the entry period for one more day! The last day to submit your entry is TODAY, August 12! We’ll announce the winner on Wednesday, August 14. But we encourage you all to attend this great concert put on by the Pacific Symphony Orchestra on the evening of August 17 in Irvine. Tickets are still available HERE. We’ll announce the winner of our giveaway tomorrow, August 14! UPDATE 8/14 – Congratulations to Lauren Albee who is our giveaway winner! It was really tough choosing who to give the tickets to because all of you had pretty convincing and heartfelt reasons, but Lauren hit it right on the spot when she wrote that the music is central to how it makes us (and the musicians) feel. Lauren, we hope that you and your guest feel the magic of Disney and Pixar this Saturday night. Again, our thanks to everyone who entered! Expect more great giveaways from DisneyExaminer soon! Our special thanks to Disney Music Publishing, Pixar, and the Pacific Symphony for their help in putting this mini Feature Story together. As we said in the story, tickets are still available for the next showing of “Pixar In Concert.” If you’re in the Southern California area and are looking for a great date night, family outing, music appreciation evening filled with great Disney music and your favorite Pixar characters and worlds, please come down and join us on August 17 for what is sure to be a night of great music and Disney movie magic! My name is Aaron Lee and my email address is musicgoon (at) gmail (dot com). I should receive the pair of tickets because my wife and I love Disney and Pixar! We just came back from our honeymoon at Aulani, so that is why we cannot afford the tickets. My wife is an artist, I am a musician. I have great respect for Disney music. Alan Menken is why I am into scoring music for films, and I love Michael Giacchino’s work. We would truly appreciate being able to enjoy the night of Disney music! I am Michael Siyluy and my e-mail is msiyluyg8@gmail.com. being in live music performances would be sublime. Especially if it is Disney. I would love to get the tickets, because I love Disney music. I grew up listening to it ALL. THE. TIME. I would love it! I love Disney and Pixar. It would be an amazing experience to hear Disney and Pixar performed LIVE by an orchestra! I can’t wait to experience this! My youth performance group has performed two sets of songs from Disney – Aladdin and Fantasmic. These two pieces alone have inspired both my youth group and those who watched it. Even if our performance had many mistakes, the atmosphere, the feeling of joy and awe created by the music, was just so amazing that I believe our performance was successful in inspiring everyone. I can’t imagine how touching it will be to listen to the original orchestra. I may not be a huge Disney fan but anyone can see how great the music is! Both Disney and music are huge parts of my life. I was fortunate enough in high school to be invited to Disneyland for both marching band and jazz band performances. Being a part of the Disney Performing Arts program is a major highlight of my music career. Experiencing a symphonic Disney-PIxar production would be very special to me. I’m still a huge music nerd and a huge Disney fan as well, 22 or not, one is never too old. I’m currently studying music composition at USC, however, my free moments are devoted to scoring films. The reason I became involved in film scoring was due to the fantastic music of Pixar, falling in love with Randy Newman’s score to Bug’s Life at age 4. Such creative films provide enormous musical opportunities that Giacchino, the Newman clan, Doyle, and Brion on the newest short have all taken full advantage of, creating some of the most memorable scores of all time. I would be delighted to hear the music that inspired me so deeply by such a wonderful orchestra. I have always loved the music to the Pixar films. I play them on repeat in my car 😀 It would be amazing to see and hear the music played in a live setting. Music plays such a powerful role in everyday life and in films. Just by listening to the music, your emotions run wild. I wonder if the musicians get as emotional as the listeners get?? I hope I win so I can experience those powerful feelings with the audience and the musicians. Congrats, Lauren! You’re our winner for the Pixar In Concert tickets giveaway! Please check your email for instructions on how to pick up your tickets. Because Pixar is awesome and I would have so much fun and be so happy to actually win something! I have always been a huge fan of Disney and Pixar. I have a dream of being a film director and later on to compose the music that creates the entire mood of films. I have always loved film scores especially in pixar movies and shorts. It would be an honor to attend this and listen to the beautiful music live! It would light my fire of pursuing my dream even more as I enter my senior year of High school. Thank you so much for your time and giving this opportunity to the readers of Disney Examiner! the power of music, thus ensuing in her the magic that is simply called “Disney”. I want to win the pair of tickets because Pixar’s music is amazing and I would love the opportunity to see it being performed live…a great and fun way to remember all of the incredible stories Pixar has brought to life on the big screens. Ever since I have been a little boy I have been a fan of Toy Story. I love all the hard work that Pixar put into all the films. Music is a big for me because it sets the mood. I would like to win the tickets not just to listen to the awesome but to relive my childhood. I’ve always noticed the music while watching Disney movies. After I watch each movie, I remember the music listen to the soundtracks. Just the other night, I was humming the songs from Fantasia 2000 and Up. To hear the work of the extremely talented composers (my favorite being Michael Giacchino) as well as the performers would be absolutely magical. Pixar has put out such great movies for both children and adults. I would love to have a great time enjoying the music of such great films.